Broncos will hold on-field practices for the first time Tuesday as the cornerback continues to send message through his absence. There will be quarterback Joe Flacco running the Broncos’ offense for the first time. There will be Vic Fangio coaching the Broncos’ defense, offense and special teams for the first time. There will not be Chris Harris Jr. this week at the Broncos’ voluntary minicamp. The Broncos’ star cornerback will continue to skip the team’s offseason’s program for the first time as a way to send a message he wants his contract reworked. Harris has been working out in Dallas with his personal trainer Ronnie Braxton. If it seems like the Broncos’ minicamp snuck up on people, it’s because they have a “new coach” schedule this offseason. Because Fangio is a first-year head coach, the Broncos were allowed to start their offseason program two weeks earlier than teams with a returning head coach. New head-coach teams also get an extra minicamp before the draft. The purpose is to give a new coaching staff a little more evaluation of their players before determining draft needs. So the Broncos had two weeks of conditioning, followed by their full minicamp this week that includes up to10-hour days of meetings, walkthroughs, a full practice that includes 11-on-11 drills and conditioning. Fangio and his coaching staff can run this minicamp like a regular, non-contact, no-padded practice. Next week, it’s back to phase 2 of offseason work as the coaches can be on the field for instruction, but there cannot be any 11-on-11 work. So after two weeks of weightlifting and conditioning, the Broncos will jump right into practice Tuesday. And then return to a lighter phase of work next week. There will be player physicals on Monday, a full day of meetings, walkthroughs and practices on Tuesday and Wednesday, and then a half-day of work on Thursday. While most players on other teams are reporting for conditioning for the first time this week, Flacco will get an early chance to get on the practice field with the Broncos’ first-team offense. 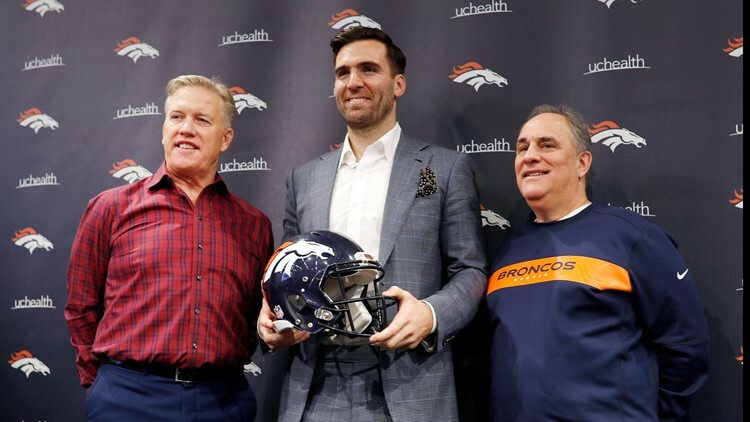 Flacco, a former Super Bowl MVP and 10 1/2 -season starter for the Baltimore Ravens, was acquired earlier this offseason by the Broncos in exchange for a fourth-round draft pick. The Broncos then traded away their starting quarterback from last year, Case Keenum, to Washington in exchange for $3.5 million and a one-round jump in next year's draft. Flacco won’t have starting receiver Emmanuel Sanders (Achilles), running back Phillip Lindsay (wrist) or left guard Ron Leary (Achilles) at practices this week. He will have receivers Courtland Sutton, DaeSean Hamilton and Tim Patrick, tight end Jeff Heuerman, new right tackle Ja'Wuan James and running backs Royce Freeman and Devontae Booker. Flaco won't be throwing against Harris. So far there have been no negotiations since Harris decided two weeks ago to stay away from the team. Broncos general manager John Elway has said he wants to wait until sometime after the NFL Draft, which will be held April 25-27, before addressing Harris’ contract. Meanwhile, Flacco, Fangio and 2019 Broncos take the field for the first time this week.